These party badges are 57mm diameter and are available for immediate posting. The badges are secured with a safety pin fastener. You can view more of our birthday badges, as well as our other standard off the shelf party badges, by clicking the following link to Personalised Badges where you can choose from customised party badges with the birthday boy or girl’s name. As well as order badges for parties which can also include guest names. 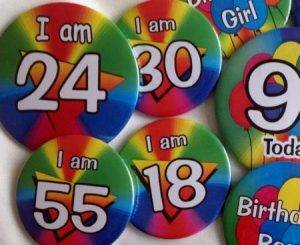 We also have a selection of birthday badges with ages. We have a large selection of designs whic h are suitable for all age groups and all styles of birthday party badges. If you are having a large party then you could order one badge for the birthday person and then choose to get individual badges for all the guests. This is a particularly good idea if a lot of the guests don’t know each other as it helps to get people talking to each other and to make your event a great success for everyone who is attending. Our designs can be as simple or complex as you wish. For the younger people we have trains, animals, cake, cars, pirates, ballerinas and a whole hosts of other designs. For the older ones, there are standard designs for birthday badges with star backgrounds, balloons, rainbow colours. And of course for all ages you can send us a photograph and we can include this as the background for the badges. Provided you have permission to use the photo then you don’t need to worry about cropping it or removing people from the background. We can do a simple clean up of the background and remove any unwanted items or people. If required we can also scan an old photo if you only have this available in a hard copy. On all party badges, if required we can also put the age – with any age possible from 1 to 100+.